The present Parish of Kimpton extends from Peters Green in the north, to the Cross Keys Public House, Gustard Wood in the south, and from the Blue Cross Animal Rehoming Centre on Kimpton Bottom in the west to Kimpton Mill in the east. It covers an area of approx. 3700 acres, almost entirely farming land; only about 170 acres of woodland remain. 2000 years ago the entire area would have been covered with forest since the heavy clay soil was ideal for tree growth. Early men with their primitive flint axes found tree-felling slow and laborious; so they tended to keep to the more open tracts of country. It is therefore not surprising that no trace of early man has yet been found in the Parish. In these times an active river would have flowed down the Kimpton Valley, entering the River Mimram near the present Kimpton Mill. The Romans occupied this country for nearly 400 years from 43 A.D. onwards. They brought with them a very advanced culture. One of their largest settlements was at Verulamium (now St. Albans) and remains of villas have also been excavated at Welwyn and Hitchin. We have no evidence of Roman dwellings in the Parish, although in 1815 workmen widening a road in Priors Wood found a dark coloured urn containing a hoard of 230 silver republican and imperial coins. The oldest of these was minted in 2 B.C. and the most recent 104 A.D.
A Roman chariot bell is also supposed to have been found at Blackmore End. This may have been a relic from one of the bloody encounters between Boudicca (Boadicea) Queen of the Iceni tribes of East Anglia and the Roman Governor Suetonius. WATLING STREET, London to Chester, running through St. Albans and Dunstable. .
ERMINE STREET London to Lincoln, running through Hertford and Royston. · ST. ALBANS - ICKLEFORD near HITCHIN, via edge of Gustard Wood Common - Kimpton Hall Farm - Kimpton Memorial Hall - Cuckolds Cross. AYOTBURY (Near WELWYN) - FRIARS WASH, via the high ground to the north of the Lea Valley, passing behind Cross Keys Public House - then changing direction slightly to follow the now disused road which ran up to 1874 from Blackmore End to Raisins Farm. Traces of these roads are difficult to see to the inexperienced eye. Over many centuries remains of the original surface have been covered by a layer of topsoil, and often all traces have been obliterated by ploughing or building. Scorch marks sometimes indicate the route across fields, especially if they can be viewed from the air. 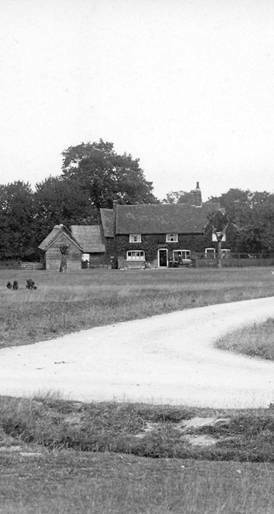 In the dry summer of 1959 clear scorch marks appeared in front of Heron's Farm at the far corner of Gustard Wood Common. Local archaeologists excavated a trench to section the road, which proved to be 18 feet wide. Regrettably a modern barn now stands on the site. Over the years the Roman soldiers had gradually been called away from Britain to fight on other fronts and by 410 A.D. the British were left to defend themselves as best they could from the warlike Scots from Ireland, and the Picts from Scotland. Once the Romans had left there was no central organisation to finance or carry out repairs to the roads, which were anyway an easy means of access to invaders. 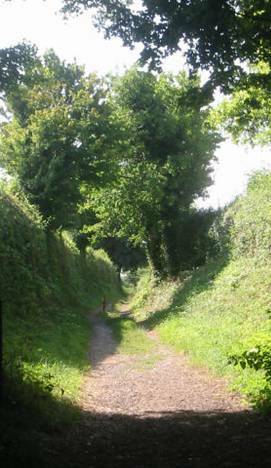 So the roads fell into disrepair, and were quickly overgrown forming low ridges and hedgerows which were often used as boundary markers in later times. Our own Parish boundary partly follows two of these roads. For the next 500 years our island was continuously under attack from Scots, Picts, Vikings, Danes, Angles, and the Saxons from northern Germany. Following in the wake of the Saxon invaders however came the Saxon immigrants who were mainly farmers. They began to clear the land and cultivate it, slowly working their way up the river valleys. So the first settlers in Kimpton probably appeared during this period, possibly in the vicinity of Kimpton Mill. They founded self-contained communities, building their huts in an elevated position overlooking their fields. Farm. Part of an ancent track.